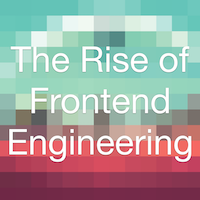 For Frontend Engineers interested in getting better at their craft. Here are examples of everything new in ECMAScript 2016, 2017, and 2018 - Rajaraodv, over on freecodecamp’s Medium blog goes through the new hotness in JS. Front-End Developer Handbook 2018 - I would be absolutely crazy not to include this link. This is written by Cody Lindley author of many great JS books including one of my favorites “Dom Enlightenment” (http://www.domenlightenment.com/). How I stopped using Bootstrap’s layout thanks to CSS Grid - Cédric Kui over on Theodo’s company tech blog talks about ditching Bootstrap for 89% browser compatible CSS Grid. How CSS works: Parsing & painting CSS in the critical rendering path - On LogRocket’s Medium blog, Benjamin Johnson explains how CSS works in the browser in some detail. If you don’t know what the CSS Object Model is, time to read up. Like this list? Want to get it in your inbox? 30 Seconds of CSS - From the site, “A curated collection of useful CSS snippets you can understand in 30 seconds or less.” I like the idea of short snippets presented well for easy reading. Compilers are the New Frameworks - From Tom Dale’s blog, he provides some thought-provoking sentences about where our web apps may be heading. React’s New Context API Explained - From Wes Bos, on his personal site, he gives an example on github on how you might use this new React API. Autoplay Policy Changes - From François Beaufort who works on the Chromium team, some important updates that every Frontend Engineer needs to know about autoplay if their site has video that does this. TLDR: Times are a changin’. Frontend Case Studies - On Andrew Romanov’s GitHub, he puts together a great collection of Frontend Case Studies in the real world. Must read. Hierarchy of documentation dysfunction - While not Frontend specific, Chris Allen on his publication Lore, he goes into the reason you should document your code, at many levels. I for one, believe we should all take a moment and read this. Too often is the case when I look at new projects, there is absolutely no documentation - unacceptable. How to Write CSS That Works in Every Browser, Even the Old Ones - Jen Simmons, again on the Mozilla Hacks blog dropping knowledge about CSS. Love it. Serverless Stack - From the site, “Serverless Stack is an open source guide for building and deploying full-stack apps using Serverless and React on AWS. Create a note-taking app from scratch using the Serverless Framework and Create React App.” Nice thorough free resource. Hyperapp + Parcel = 😎 - Adam Boro writes on the Medium blog of Daftcode, about using Hyperapp, a React-like JS framework, and Parcel, a no-config bundler together to quickly build a lightweight webapp. Using Conic Gradients and CSS Variables to Create a Doughnut Chart Output for a Range Input - Ann Tudor, over on the CSS-Tricks blog gives a nice example of using conic-gradient. front-end-interview-handbook - Yangshun Tay, working at Facebook, has put a nice repo on github together going over answers to the ‘front-end-interview-handbook’. Must read. headless-devtools - Johnny over on his github says,”Lets you perform Chrome DevTools actions from code by leveraging Headless Chrome+Puppeteer”. This looks really useful to run some automated info about your webapp. Love by Ronik - Love by Ronik, is a cool project put together for Valentine’s Day. Worth a look to see the source on github and see how they use WebGL + React. CSS Grid — Learn all about CSS Grid with Wes Bos in this free video series! - Wes says on his blog, “The course is 25 videos, about 4 hours long and 100% free.” Um yes. New flexbox guides on MDN – Mozilla Hacks – the Web developer blog - The awesome Rachel Andrew has added eight new guides on MDN for your reading pleasure. Modern CSS Explained For Dinosaurs – Actualize – Medium - From Actualize Coding Bootcamp Medium blog, Peter Jang starts out with, “CSS is strangely considered both one of the easiest and one of the hardest languages to learn as a web developer.” Yes. Dropping truth. 3 key insights that make D3.js easy to learn - A geek with a hat - From Swizec Teller’s blog, a great succinct summary of D3.js, and it’s key concepts. HTML5 Accessibility - Just as the site says, “Get the current accessibility support status of HTML5 features across major browsers. Editor’s draft, December 2017”. From Bootstrap to CSS Grid - From Natalya, a FE Dev at The NY Times’ Open blog on Medium, she outlines how the NYTimes started using CSS Grid. THE ULTIMATE FLEXBOX CHEAT SHEET - From Sean Fioritto author of “Sketching with CSS”, he gives a nice cheatsheet on Flexbox. WebToolsWeekly Newsletter - From Louis Lazaris, a weekly curated newsletter about, you guessed it, web tools! The most essential list of resources for Front-End beginners - On David Dias’s github, a really good list for beginners. 11 React Component Libraries You Should Know In 2018 - Some good UI libs to checkout for React from Jonathan Saring, on the Bit blog. CSS Specificity Calculator - From Keegan Street, a nifty CSS specificity calculator. Even has an npm module you could use on your own. Flexbox and Grids, your layout’s best friends - From the Aerolab development blog, Eva Ferreira, UI Developer, writes “We decided to debunk the myths around Flexbox & Grids in order to show you the power of these two technologies working together.” This is a thorough look at how the two CSS layouts can work together. Like this list? Want to get it in your inbox? Sign up for newsletter!